Go the distance with this "Rocky Heavyweight" collection, featuring all six knockout Rocky films including the first film with a stunning new master. Sylvester Stallone stars in the greatest boxing saga of all time and triumphs as one of the most inspirational characters in cinematic history. Witness every epic, action-packed fight and unforgettable moment as Rocky strives for greatness through sheer determination against impossible odds. This collection contains over three hours of bonus features including a new featurette “8mm Home Movies of Rocky” narrated by Director John Avildsen. Man, have I reviewed 1976’s Rocky a lot! This becomes my look at the film, which means it’s time to avoid a recap of my thoughts about it. If you want to read my opinion, click here for my original review. To summarize, Rocky remains a very good film. The story of the underdog who makes good is as old as time itself, but it continues to maintain appeal and the movie shows how that can happen. I won't argue that Rocky deserved its Best Picture victory over some strong competitors, but I think it's a nice piece of work nonetheless. Rocky appears in an aspect ratio of approximately 1.85:1 on this Blu-ray Disc. The film showed its age but looked about as good as I could hope. Sharpness was mostly good. A little softness interfered, virtually all of which seemed to come from the source photography. The majority of the flick came across as reasonably well-defined. I noticed no jagged edges or shimmering, and edge enhancement remained absent. With a nice layer of grain, the movie appeared to lack intrusive noise reduction, and print flaws failed to mar the presentation. Colors were generally subdued - this is a gritty character drama, after all, and Philly isn't Miami – but they fit the film well. Hues appeared accurate and showed nice clarity. Black levels appeared fairly deep and dark, and shadow detail also was appropriately thick without any signs of murkiness. The low-budget Rocky will never offer a dazzling visual presentation, but this transfer brought it home well. This DTS-HD MA 5.1 remix of the original monaural audio – which also appears on the disc - expanded the image in a modest but pleasing manner. Most of the sound focused on the front center channel, but effects spread nicely to the sides as well. Probably the "showiest" instance happened early in the film when Rocky walked past some street singers and their voices panned from the center to the right. Other than that, it's just music - which boasted some very nice stereo separation - and ambiance on the sides. The surrounds also included these factors. These never opened up the track in a dynamic sense, but they added a good feel for the settings. Quality seemed decent but unexceptional. Dialogue appeared vaguely flat for the most part, but it remained consistently intelligible and clear. The one poor instance that involved speech occurred at about the 74-minute mark, when Rocky and Paulie talk in the meat locker; the dialogue sounded rough and edgy during that scene. This wasn't an issue at other times, though. Effects were clean though thin, and the music sounded pleasantly crisp and distinct; the score largely lacked much low-end but it seemed adequately reproduced. The 5.1 mix stayed appropriately modest and worked nicely for the film. How did this 2014 release compare with the 2006 Blu-ray of Rocky? Audio was identical, but the visuals improved. Part of a new 4K transfer, the image looked tighter, cleaner and more natural. This became a good step up in quality. While the 2006 Blu-ray – and a 2011 version accompanied by a book - offered nearly no extras, the 2014 re-issue comes with ample features, most of which come from the excellent 2006 Collector’s Edition DVD . To start, we find three separate audio commentaries. The first comes from writer/actor Sylvester Stallone, as he offers a running, screen-specific chat. Stallone gets into characters and themes, sets and locations, the script and altered/deleted sequences, cast and performances, the boxing scenes, and various scene specifics. For the second commentary, we hear from boxing legends trainer Lou Duva and commentator Bert Sugar. Both sit together for their own running, screen-specific track. They mostly joke around and razz each other. However, they do reflect on aspects of the movie as well as elements of their own lives and careers. A few featurettes follow. Three Rounds with Lou Duva runs four minutes, 31 seconds and gives us more notes from the trainer. He discusses his early days in the business and aspects of his work. It’s marginally interesting at best but not particularly valuable. For more with Duva’s commentary partner, we turn to Interview with a Legend - Bert Sugar: Author/Commentator and Historian. The six-minute and 47-second piece looks at his early exposure to boxing, the sport’s depiction in movies and thoughts about Rocky. Sugar proves more eloquent than Duva but not much more interesting in this forgettable clip. Finally, The Opponents goes for 16 minutes, 10 seconds. We hear from Chartoff, Weathers, and actors Dolph Lundgren and Tommy Morrison. “Opponents” looks at all Rocky’s foes throughout the first five movies. We get some casting and performance notes as well as thoughts about the characters. Too many movie clips show up here, but the program offers a pretty fulfilling examination of Rocky’s opponents. In addition to two trailers and three TV Spots, we find a three-part documentary called In the Ring. This one-hour, 14-minute and 59-second program offers the expected mix of movie clips, behind the scenes materials, and interviews. We hear from Stallone, Winkler, Chartoff, Weathers, Shire, Avildsen, and Young. “Ring” starts with the origins of the project and its development. We find out how various members of the crew and cast came on-board as well as adapting the material for the actors and aspects of the performances and characters. We also learn a little about shooting the boxing sequences and the score. We learn more about technical innovations via Steadicam: Then and Now with Garrett Brown. The piece runs 17 minutes, 35 seconds and features notes from Brown as he discusses his career and how he came up with the Steadicam. He also chats about his work on Rocky and the subsequent success of the Steadicam. Lots of good archival footage fleshes out Brown’s comments. These allow the featurette to illuminate and entertain. During the 15-minute and 18-second Make-Up! The Art and Form with Michael Westmore, we hear from the make-up designer and supervisor as he covers his family roots in the business as well as his work on Rocky and other aspects of his career. Star Trek fans will know Westmore from his designs for the various spin-off series. Westmore provides a nice look at his work on the film and makes this a useful show. For a look at the movie’s famous music, we head to Staccato: A Composer’s Notebook with Bill Conti. This offers an 11-minute and 37-second program during which the composer goes over his creations for Rocky along with recording the tracks. As with its predecessors, this becomes another solid little take on its topics. The Ring of Truth lasts nine minutes, 35 seconds as it presents remarks from art director James Spencer. He talks about locations and set design as well as budgetary restrictions. We learn a fair amount about the production dressing in this tight and satisfying show. Next comes an intriguing look Behind the Scene With Director John Avildsen. In this 12-minute and 27-second piece, Avildsen discusses the fight rehearsal process and also shows a variety of 8mm test shots made to help refine the choreography between Stallone and Weathers. Also included are some glimpses of early make-up concepts. One of those would have allowed Stallone to easily fit on the set of Frankenstein. Although Avildsen’s remarks repeat some of the material heard on the commentary - indeed, the latter seems to use the exact same tape - the 8mm test material is a terrific find and it offers a fun view of the filmmaking process. The next two featurettes pay homage to two now-deceased Rocky contributors. A Tribute to Burgess Meredith combines remembrances from Stallone, Young, Weathers, and Meredith’s friend, actress Lee Grant into a seven-minute and 47-second piece. All except for Stallone - whose statements come from his “Video Commentary” sessions - appear only as voice-overs while we see stills of Meredith. A Tribute to James Crabe lasts for three minutes and 37 seconds as director Avildsen talks about the film’s cinematographer. Both pieces are respectful and interesting, and I thought they added a classy touch to the disc. Next we get a clip of Sylvester Stallone on Dinah! (1976) that lasts 17 minutes and 17 seconds. Stallone schmoozes with host Dinah Shore and fellow guest Joey Bishop as part of the publicity for the movie. The clip is interesting as a historical curiosity but other than Stallone’s hideous suit, there’s nothing particularly compelling on display. Created in 1990 to promote Rocky V, Stallone Meets Rocky lasts two minutes, 59 seconds. In this, the actor chats with his creation in a jokey manner. It offers some fun. New to this Blu-ray, 8mm Home Movies of Rocky go for eight minutes, 13 seconds. Accompanied by narration from Avildsen and production manager Lloyd Kaufman, we see the aforementioned material from the set. Nothing exceptional appears, but these snippets offer a cool look behind the scenes. Rocky continues to hold up well after 38 years. The movie marks the creative high point of Sylvester Stallone’s career, and it offers a moving and inspirational look at a bum made good. The Blu-ray provides solid picture and audio along with an excellent set of bonus materials. Without question, this becomes the best home video release of Rocky to date. 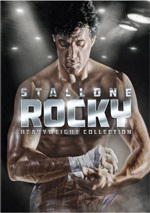 Note that as of February 2014, this version of Rocky can be purchased solely as part of the six-film “Rocky: Heavyweight Collection”. It contains Rocky and all five of its sequels. I believe that the sequels all replicate previously-released Blu-ray Discs; only the first film delivers a fresh transfer.